Born in Ethiopia, Ms. Anna Getaneh is blessed with not only a beautiful appearance but also a kind and loving heart. In 1993, she participated in a charity event held by Pharmacists Without Borders, visiting a refugee camp at Moyale on the border of Ethiopia and Kenya. There she was deeply saddened to see countless children and families in poverty and misery. Upon returning home, she resolved to do something for her compatriots. 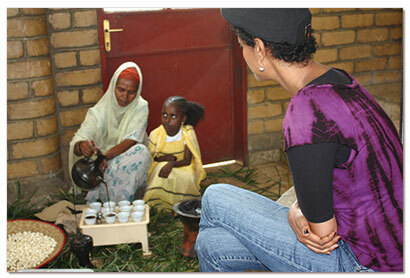 In 1997, she secured a 37-acre plot of land in the village of Aleltu, 55 kilometers from the country’s capital, Addis Ababa. 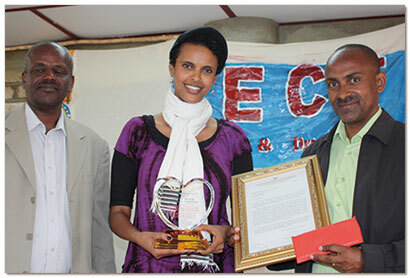 There she founded a nongovernment organization—the Ethiopian Children’s Fund (ECF). The first initiative they launched in the village was the ECF Education and Development Program (ECF-EDP) to help children in remote areas receive an education. Its teachers embrace a vision of “Children First” in the belief that children should be free of worries and economic pressures normally faced by adults. They should be allowed to grow up in a happy and carefree environment. Therefore, in addition to providing nutritious meals and health care to the young generation, they feel the most important thing for children is to grow up under tender loving care. 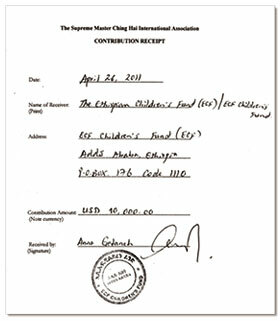 On learning about the compassionate deeds of this charitable organization, Supreme Master Ching Hai honored them and Miss Getaneh with the Shining World Compassion Award, as well as contributing US$10,000 to support ECF’s noble projects. The Award was presented by our Association members on April 26, Golden Year 8 (2011) and Miss Getaneh especially found time amid her busy schedule to attend the event with her entire staff. Children from the ECF welcomed our Association members with a traditional dance and expressed their gratitude for Supreme Master Ching Hai’s loving concern with a special Ethiopian Coffee Ceremony. With sincere appreciation of Miss Getaneh’s selfless contribution, we hope that she will soon realize her dream of ensuring the most innocent of happy childhoods for all Ethiopian children.